Minimize Effort and Maximize Results! 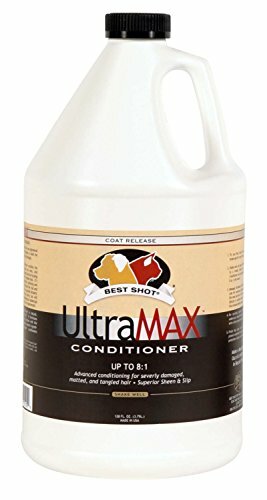 UltraMAX PRO Conditioner embodies technically advanced molecular hydrating conditioners that penetrate the hairs cortex and close the lifted cuticles to achieve a silky smooth sheen. Features Coat Release technology for excessive shedding, thick undercoat, and long drop coats requiring slip, amazing flow and bounce. Also recommended for severely damaged, matted and tangled hair. Engineered for dog fanciers that demand results, not promises! Refreshing Sweet Pea fragrance. Safe for Dogs, Cats, Puppies & Kittens. Dilutes up to 8:1 for desired custom effect. Available in 17 ounce and 1.1 gallon sizes. Try using with Best Shot’s original Ultra Wash, Lemon-Aid, M.E.D., or One Shot shampoos and discover endless possibilities. Features Coat Release technology for excessive shedding, thick undercoat and long drop coats requiring slip and flow. Recommended for severely damaged, matted and tangled hair.